For students with reading difficulties, accessing curriculum textbooks can be very difficult and time consuming. The programmes mentioned below are examples of the types commonly used. Their inclusion is for information purposes only and does not constitute a recommendation from the Dyslexia Association of Ireland. For those students whose reading is reasonably competent, but where they come across occasional words that they cannot identify, a reading pen can be a good solution. These are hand held pens containing OCR software which enables them to scan and read words and phrases; they also include a dictionary to explain what a word means. Scanning Pens (www.scanningpens.co.uk) are one company that make these pens. 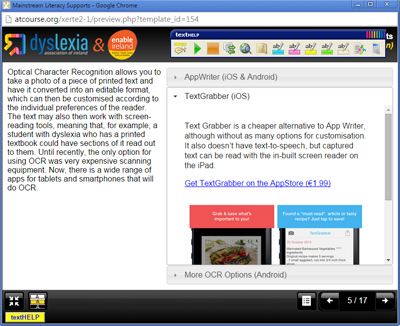 There are also lots of OCR apps for tablets and smartphones – App Writer, which is available for Apple and Android, is one example. Students who have more significant reading difficulty may need to go for a complete text-to-speech option, using screen reading software. Screen reading software will read any text on the computer screen, whether it is text which the student has just typed, an email or webpage, or pages of a textbook which have been scanned into the computer. When used together a scanner and screen reading package can make even very slow readers self-sufficient. The reading voice and reading speed can be adjusted; words can be read word-by-word, in sentences or continuous passages. Text scanned in can be converted to an audio file format and downloaded onto an MP3 player to be listened to later. Examples of this type of screen reading programme are ClaroRead, Kurzweil and TextHelp Read & Write. ClaroRead and TextHELP have additional features supporting the production of written work, e.g. talking spell checker, homophone checkers and predictive typing. ClaroRead works closely alongside Dragon Dictate (see below) resulting in seamless dictation and proof reading of text. Mobile versions of this type of software are now becoming available (the programme comes on a USB drive); this means that the student can carry the software with them and use it on any compatible computer. There are also various free and low-cost options for screen reading. WordTalk is a free plug-in for Microsoft Word that reads out text and also has a talking dictionary feature. Many PDFs have an in-built screen reader, which can be activated by going to ‘View’ and then selecting ‘Read Out Loud’. Most tablets and smartphones now have in-built screen reading features. These can usually be activated by going into the Accessibility menu. iPads, for example, have two options, Speak Select and Speak Screen. Speak Select allows a small section of text, or individual words, to be highlighted and then spoken whilst Speak Screen reads the entire screen out. There are also many apps available such as Voice Dream for Apple and IVONA Text-to-Speech for Android. Digital versions of textbooks are often not available commercially, but it is always worth contacting the publishers to see if they can provide a digital version of the content. The move to digital books will be a great benefit to people with dyslexia and others as it is making digital content much more accessible. The Intel Reader is a portable device which can capture an image of a page of text, display it on screen and then read it for the user. Access to digital copies of second level textbooks is constantly improving, and digital copies can be used with screen reading software to have the textbooks read out to the student – the file below contains further information.